It’s been a month or so since my last mini review edition and I’ve been feeling a little sluggish and horrifically busy so I have two reviews. I liked both these books but there was something missing about both of them. Thank you Harlequin Teen for sending me this copy. No compensation was given or taken to alter the this review. When it comes to the Steampunk genre, I incline to have emotions jumbled all over the place. The Girl With The Iron Touch tended to be a novel I was on the fence about. While it was most to say, satisfying, I expected much more from Kady Cross. Told in mainly perspectives of Finley and Emily, we were lead on an another enthralling journey in the world of automatons and Steampunkiness. I am a big fan for Kady’s writing style, there’s something to it that intrigues me greatly. It’s like only her voice can write books in the Steampunk genre, there’s a hint of subtleness and story-telling mastery in there that I can detect. For our main protagonist, Finley, I feel like I can really relate to her. She’s so clear minded and has just strong will that I really admire. I’ve never treated Finley like she was some heroine, she was always that girl stuck in the middle of everything but was so genuine and compliant. There were times her where I could feel like I could reach out to her, for her personality was so well created and defined. This is probably due to the fact that Finley has slowly become to harness her two selves, gaining overall harmony between good and evil. What really ruined this novel for me was two things: firstly, the romance. In the two previous books, I became agitated that the fact we barely had any romance, there used to be an agreeable angst floating in the air. In this novel, yes. Our love triangle does get resolved (even though I never thought there REALLY was a love triangle, but others seem to deem so) but it was so uneven and all over the place. As individuals, Griffin, Jack and Finley are admirable characters, but when we get them interacting it seemed so over done and forced. One time they were kissing, the next they were not even talking. Also, the romance stole the action and plot a tad too much for my liking. Secondly, like the romance, the pacing of The Girl With The Iron Touch was irregular. We had action, the a big plop of boredom. It just could compromise with me well at all. Imagine if she hadn’t fogotten the book. Or if there hadn’t been traffic on the expressway. Or if she hadn’t fumbled the coins for the toll. What if she’d run just that little bit faster and caught the flight she was supposed to be on. Would it have been something else – the weather over the atlantic or a fault with the plane? The Statistical Probability of Love at First Sight was more than what I had been expecting. For such a short novel, it was compact with cuteness, rich emotions and great morals that I still can’t pondering about. Set in 24 hours, we follow Hadley at an airport and find that maybe you can really fall in love in quickly. My main concern with The Statistical Probability of Love at First Sight was that it was going to have instant love. Fortunately, I did not observe any bit of that. Smith did an awfully great job by making two people form a chemistry within a day without making me twist about in frustration. However, this book most definitely is not all about two people falling in love. We delve in much deeper than that towards Hadley’s parents’ issue. The reason why Hadley was at the airport in the first place was to go her father’s wedding. To a wedding where she had not even met the bride. Throughout the book, we get flashbacks of her mum and dad, and their experience of love, and maybe that it’s not all about cupcakes and daisies. It’s more heart breaking and fragile. For my first book by Jennifer E. Smith, I am extremely pleased by the outcome. I’ll be eager to read her other contemporary novel, This Is What Happy Looks Like and hope it’s as beautiful and moving like this one. I adore steampunk but for some reason I’ve been keeping away from this series. i think it’s time to give it a chance. I was very unhappy with The Statistical Probability because I felt that it just glazed over some very important family issues, which I didn’t appreciate. I don’t like it when things get too easily resolved. But it was also very cute at times, so there’s that. I am not a huge fan of steampunk so those books have never really been ones I have wanted on my TBR but I do have TSPoLaFS and I really want to get to it soon. Happy to see that it worked so well for you. I read Smith’s second book, This Is What Happy Looks Like, and it didn’t blow me away like I had wanted it to. Darn expectations! This Is What Happy Looks Like was great. I liked it even more than The Statistical Probability of Love at First Sight 🙂 I also had similar feelings about the romance in The Girl With the Iron Touch. Amazing reviews! I love the covers for both books. The closest I’ve come to steampunk is the Larklight series. But it was fun! Wow, I’m excited for The Statistical Probability of Love at First Sight. Wonder if i can find it on book depository. 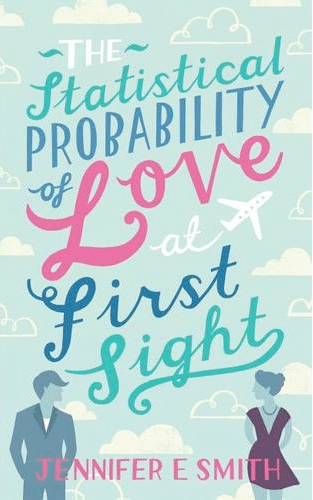 I’ve been curious about The Statistical Probability of Love at First Sight, but haven’t read it yet.